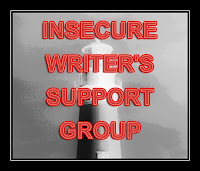 The Insecure Writers Support Group was created by the wonderfully talented Mr Alex J Cavanaugh, so that writers could talk and communicate to others about the fears and insecurities that they might have. You can visit Alex Here, or you if you want to join us in discussing our insecurities on the first Wednesday of each month, you are welcome to join by going Here. Congratulations with the 2 year anniversary Alex! Thank you for giving us writers this outlet. I bet you must be so happy and proud. It has been really fun and therapeutic to get all my insecurities out there. I must say that though it has been two years, I still feel insecure about certain things, but I think that is normal. I don't think that if you are a writer that you ever stop feeling insecure about your work or any of the writing processes. But I am less crazy about it all. I know I have to work on sharing my work. I always fear posting any of my writing on my blog. I fear my peers. I fear being ripped to shreds. But that kind of feedback would probably be very useful. I guess I am just secure in general. How about you? How is your insecurity level this month? I'm not a part of this group, but I follow a lot of people who are, so inevitably, on this day of the month, my inbox is fuller than usual. For the record, I think that insecurities are good. It gives us something to strengthen and work on. I think insecurities are normal. None of us can escape them every day. Maybe they help us be sure we edit our work until it's our very best. Oh dear, I do hope your insecurities become less, Murees, there is no need for these worries, just go for it girl!! I feel you Murees !! I think insecurities in writers is normal, too, and this group has definitely shown over the past two years that we're not alone in our worries. I like Katie's view on insecurities. My son calls me a shy sharer. So, yeah I'm pretty insecure about my writing. Less crazy is good! It doesn't go away completely, but shared its power over us decreases. Katie - So true. Insecurities can be good for something. Thank you for the encouragement. Deanie - I agree. It helps me want to edit more. I know I need to edit more. Carole - Thank you! I guess I should just do it. You are so right. Jyoti - Thank you. It is nice to know I do not suffer from this insecurity alone. Julie - Thank you so much! You just made me smile. Sandy - I like that you don't care about insecurity or what others think or say. That is a brilliant attitude to have. Can you borrow me some of that great attitude? M.J. - I do too. I am so lucky to be part of this awesome group. You guys make blogging so worth it. Jai - I am not alone! That is really nice to know. Alex - Thanks. I think less crazy is really good for me. Thank you for creating the IWSG. You rock! Hi, Murees! I'm dropping by from your fab interview on Deanie's blog. I agree with Kate's first comment, that insecurities are good. . . and with Deanie that insecurities are normal and think that focusing on them as negatives can pull a person down. Why can't writers be secure in the knowledge there's a story inside waiting to come out? And that learning one's craft helps release the story? Hi Murees .. you sound like we most all feel ...and you're in the right supportive group .. enjoy the process, don't worry and keep on writing ..
Kittie - Thank you for the wise words. It is always easier to doubt our talent than to admit being good. Or at least that is how it is in my case. Thank you so much for coming over. Hilary - Thank you. I am really lucky to be part of this group.